Gates of the wénmiào of Datong, Shanxi. Confucianism, also known as Ruism, is described as tradition, a philosophy, a religion, a humanistic or rationalistic religion, a way of governing, or simply a way of life. Confucianism developed from what was later called the Hundred Schools of Thought from the teachings of the Chinese philosopher Confucius (551–479 BCE), who considered himself a retransmitter of the values of the Zhou dynasty golden age of several centuries before. In the Han dynasty (206 BCE – 220 CE), Confucian approaches edged out the "proto-Taoist" Huang-Lao, as the official ideology while the emperors mixed both with the realist techniques of Legalism. The disintegration of the Han political order in the second century CE opened the way for the doctrines of Buddhism and Neo-Taoism, which offered spiritual explanations lacking in Confucianism. A Confucian revival began during the Tang dynasty of 618-907. In the late Tang, Confucianism developed in response to Buddhism and Taoism and was reformulated as Neo-Confucianism. This reinvigorated form was adopted as the basis of the imperial exams and the core philosophy of the scholar official class in the Song dynasty (960-1297). The abolition of the examination system in 1905 marked the end of official Confucianism. The New Culture intellectuals of the early twentieth century blamed Confucianism for China's weaknesses. They searched for new doctrines to replace Confucian teachings; some of these new ideologies include the "Three Principles of the People" with the establishment of the Republic of China, and then Maoism under the People's Republic of China. In the late twentieth century Confucian work ethic has been credited with the rise of the East Asian economy. With particular emphasis on the importance of the family and social harmony, rather than on an otherworldly source of spiritual values, the core of Confucianism is humanistic. According to Herbert Fingarette's concept of "the secular as sacred", Confucianism regards the ordinary activities of human life — and especially in human relationships as a manifestation of the sacred, because they are the expression of our moral nature (xìng 性), which has a transcendent anchorage in Heaven (Tiān 天) and a proper respect for the spirits or gods (shén). While Tiān has some characteristics that overlap the category of deity, it is primarily an impersonal absolute principle, like the Dào (道) or the Brahman. Confucianism focuses on the practical order that is given by a this-worldly awareness of the Tiān. Confucian liturgy (that is called 儒 rú, or sometimes 正統/正统 zhèngtǒng, meaning "orthoprax" ritual style) led by Confucian priests or "sages of rites" (禮生/礼生 lǐshēng) to worship the gods in public and ancestral Chinese temples is preferred in various occasions, by Confucian religious groups and for civil religious rites, over Taoist or popular ritual. The this-worldly concern of Confucianism rests on the belief that human beings are fundamentally good, and teachable, improvable, and perfectible through personal and communal endeavor especially self-cultivation and self-creation. Confucian thought focuses on the cultivation of virtue and maintenance of ethics. Some of the basic Confucian ethical concepts and practices include rén, yì, and lǐ, and zhì. Rén (仁, "benevolence" or "humaneness") is the essence of the human being which manifests as compassion. It is the virtue-form of Heaven. Yì (義/义) is the upholding of righteousness and the moral disposition to do good. Lǐ (禮/礼) is a system of ritual norms and propriety that determines how a person should properly act in everyday life according to the law of Heaven. Zhì (智) is the ability to see what is right and fair, or the converse, in the behaviors exhibited by others. Confucianism holds one in contempt, either passively or actively, for failure to uphold the cardinal moral values of rén and yì. Traditionally, cultures and countries in the East Asian cultural sphere are strongly influenced by Confucianism, including mainland China, Taiwan, Hong Kong, Macau, Korea, Japan, and Vietnam, as well as various territories settled predominantly by Chinese people, such as Singapore. In the 20th century Confucianism's influence diminished greatly. In the last decades there have been talks of a "Confucian Revival" in the academic and the scholarly community and there has been a grassroots proliferation of various types of Confucian churches. In late 2015 many Confucian personalities formally established a national Holy Confucian Church (孔聖會/孔圣会 Kǒngshènghuì) in China to unify the many Confucian congregations and civil society organisations. Rújiào and Kǒngjiào contain the Chinese character jiào, the noun "teaching" or "transmission", used in such terms as "education", or "educator". The term, however, is notably used to construct the names of religions in Chinese: the terms for Islam, Judaism, Christianity, and other religions in Chinese all end with jiào. Confucianism revolves around the pursuit of the unity of the self and Tiān (Heaven, or the traditional high god of the Zhou), and the relationship of humankind to the Heaven. The principle of Heaven (Tiān lǐ 天理 or Dào 道), is the order of the creation and divine authority, monistic in its structure.Individuals can realise their humanity and become one with Heaven through the contemplation of this order. This transformation of the self can be extended to the family and society to create a harmonious fiduciary community. The moral-spiritual ideal of Confucianism conciles both the inner and outer polarities of self-cultivation and world redemption, synthesised in the ideal of "sageliness within and kingliness without". Rén, translated as "humaneness" or the essence proper of a human being, is the character of compassionate mind; it is the virtue endowed by Heaven and at the same time the means by which man can achieve oneness with Heaven or return to Heaven, or comprehend his divine nature. In the Dàtóng shū (《大同書/大同书》) it is defined as "to form one body with all things" and "when the self and others are not separated ... compassion is aroused". Tiān (天), a key concept in Chinese thought, refers to the sky, or the heavens, nature, "heaven and earth" (that is, "all things"), and to the awe-inspiring forces beyond human control.There are such a number of uses in Chinese thought that it is not possible to give one translation into English. Confucius used the term in a religious way. He wrote in the Analects (7.23) that Tian gave him life, and that Tian watched and judged. (6.28; 9.12). A person can know the movement of the Tiān, giving the sense of having a special place in the universe. (9.5) Confucius wrote that Tian spoke to him, though not in words (17.19), but the scholar Ronnie Littlejohn warns that Tian was not a personal God comparable to the God of the Abrahamic faiths in the sense of an independent creator or transcendent Being. When Confucians spoke of Tian they often meant something like what the Taoists meant by Tao (Dào): "the way things are" or "the regularities of the world." Tiān can also be compared to the Brahman of Hindu and Vedic traditions. Zǐgòng, a disciple of Confucius, said that Tiān had set the master on the path to become a wise man (Analects 9.6). In Analects 7.23 Confucius says that he has no doubt left that the Tiān gave him life, and from it he had developed the virtue (Dé, 德). In Analects 8.19 he says that the lives of the sages and their communion with Tian are interwoven. Regarding personal gods (shén, energies who emanate from and reproduce the Tiān) enliving nature, in Analects 6.22 Confucius says that it is appropriate (義/义, yì) for people to worship (敬, jìng) them, though through proper rites (禮/礼, lǐ), implying respect of positions and discretion. Confucius himself was a ritual and sacrificial master. In Analects 3.12 he explains that religious rituals produce meaningful experiences. Rites and sacrifices to the gods have an ethical importance: they generate good life, because taking part in them leads to the overcoming of the self. [note 2] Analects 10.11 tells that Confucius always took a small part of his food and placed it on the sacrificial bowls as an offering to his ancestors. In original Confucianism the concept of Tiān expresses a form of pantheism. Other philosophical currents, like Mohism, developed a more theistic idea of the Tiān. There are still many other elements, such as chéng (誠/诚, honesty), shù (恕, kindness and forgiveness), lián (廉, honesty and cleanness), chǐ (恥/耻, shame, judge and sense of right and wrong),yǒng (勇, bravery), wēn (溫/温, kind and gentle), liáng (良, good, kindhearted), gōng (恭, respectful, reverent), jiǎn (儉/俭, frugal), ràng (讓/让, modestly, self-effacing). Rén (Chinese: 仁) is the Confucian virtue denoting the good feeling a virtuous human experiences when being altruistic. It is exemplified by a normal adult's protective feelings for children. It is considered the essence of the human being, endowed by Heaven, and at the same time the means by which man can act according to the principle of Heaven (天理, Tiān lǐ) and become one with it. Yán Huí, Confucius's most outstanding student, once asked his master to describe the rules of rén and Confucius replied, "one should see nothing improper, hear nothing improper, say nothing improper, do nothing improper". Confucius also defined rén in the following way: "wishing to be established himself, seeks also to establish others; wishing to be enlarged himself, he seeks also to enlarge others". Another meaning of rén is "not to do to others as you would not wish done to yourself". Confucius also said, "rén is not far off; he who seeks it has already found it". Rén is close to man and never leaves him. Li (禮/礼) is a classical Chinese word which finds its most extensive use in Confucian and post-Confucian Chinese philosophy. Li is variously translated as "rite" or "reason", "ratio" in the pure sense of Vedic ṛta ("right", "order") when referring to the cosmic law, but when referring to its realisation in the context of human individual and social behavior it has also been translated as "custom", "mores", and "rules", among other terms. Confucianism can be traced even before the birth of its namesake, Confucius (an Anglicization of his actual name, Kong Qiu), to the general culture of the Zhou Dynasty, which emphasized politeness and consideration, though generally with more of a spiritual bent. Thought to be a real historic figure, Confucius was born on September 28, 551 BC. He reportedly grew up in a time of instability in the region that would someday be known as China, and failed in his ambitions to become a high minister of the national government. But he did become known for his attempts to analyze and codify rules of society and behavior. The system of "virtue" he proposed was one of respect for others, including for their position in society, focusing on this as a system of principles, not mysticism. 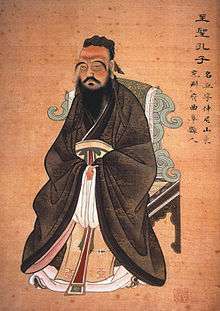 The Analects that are generally attributed to Confucius actually appear to have been compiled after his death, by followers one or two generations removed, perhaps during the Warring States period (476 BC-221 BC), though no copies exist older than 50 BC, with some scholars saying the document may have been compiled as recently as 140 BC. Confucianism went through a number of phases of being repressed or unpopular, as in the earlier part of the Han dynasty, or being tolerated, even accepted, with the later Han years being an example of this. It is not until the 12th century AD, though, that it has become such an accepted part of the state that the Analects themselves are integrated into civil service tests. In fact, this success came via Neo-Confucianism, an attempt to reform the philosophy, which had been influenced by Taoism and Buddhism and was seen as moving toward mysticism and superstition. This movement started as early as the 8th century AD, and was dominant by the 12th. While still influenced by Taoism and Buddhism, it worked to restore Confucianism to what were seen as its secular roots. The influence of Confucianism increased after the conquest of the region by the Mongol empire, whose Khans were convinced to adopt its philosophy for their own government. Since the 2000s, some intellectuals and students in China have become increasingly identified with Confucianism. In 2003 the Confucian intellectual Kang Xiaoguang published a manifesto in which he made four suggestions: Confucian education should enter official education at any level, from elementary to high school; the state should establish Confucianism as the state religion by law; Confucian religion should enter the daily life of ordinary people through standardization and development of doctrines, rituals, organisations, churches and activity sites; the Confucian religion should be spread through non-governmental organisations. Another modern proponent of the institutionalisation of Confucianism in a state church is Jiang Qing. In 2005 the Center for the Study of Confucian Religion was established, and guoxue education started to be implemented in public schools. Being well received by the population, even Confucian preachers have appeared on television since 2006. The most enthusiastic New Confucians proclaim the uniqueness and superiority of Confucian Chinese culture, and have generated some popular sentiment against Western cultural influences in China. In contemporary China, the Confucian revival has developed into different, yet interwoven, directions: the proliferation of Confucian schools or academies (shuyuan 书院), the resurgence of Confucian rites (chuántǒng lǐyí 传统礼仪), and the birth of new forms of Confucian activity on the popular level, such as the Confucian communities (shèqū rúxué 社区儒学). Some scholars also consider the reconstruction of lineage churches and their ancestral temples, as well as cults and temples of natural and national gods within broader Chinese traditional religion, as part of the revival of Confucianism. Other forms of revival are folk religious or salvationist religious groups with a specifically Confucian focus, or Confucian churches, for example the Yidan xuetang (一耽学堂) based in Beijing, the Mengmutang (孟母堂) of Shanghai, the Way of the Gods according to the Confucian Tradition or phoenix churches, the Confucian Fellowship (儒教道坛 Rújiào Dàotán) in northern Fujian which has spread rapidly over the years after its foundation, and ancestral temples of the Kong (Confucius') kin operating as Confucian-teaching churches. Also, the Hong Kong Confucian Academy has expanded its activities to the mainland, with the construction of statues of Confucius, Confucian hospitals, restoration of temples and sponsorship of other activities. In 2009 Zhou Beichen founded another institution that inherits the idea of Kang Youwei's Confucian Church, the Holy Hall of Confucius (孔圣堂 Kǒngshèngtáng) in Shenzhen affiliated with the Federation of Confucian Culture of Qufu City, the first of a nationwide movement of congregations and civil organisations that was unified in 2015 by the Holy Confucian Church (孔圣会 Kǒngshènghuì). The first spiritual leader of the Holy Church is the renowned scholar Jiang Qing. Chinese folk religion's temples and kinship ancestral shrines on special occasions may choose Confucian liturgy (that is called 儒 rú, or sometimes 正统 zhèngtǒng, meaning "orthoprax" ritual style) led by Confucian priests (礼生 lǐshēng) to worship the gods enshrined, instead of Taoist or popular ritual. "Confucian businessmen" (儒商人 rúshāngrén, also "refined businessman") is a recently recovered term that defines people of the entrepreneurial or economic elite that recognise their social responsibility and therefore apply Confucian culture to their business. The works of Confucius were translated into European languages through the agency of Jesuit scholars stationed in China. 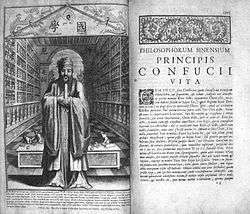 [note 3] Matteo Ricci was among the very earliest to report on the thoughts of Confucius, and father Prospero Intorcetta wrote about the life and works of Confucius in Latin in 1687. For example, the impact of the Vietnam War on Vietnam was devastating, however over the last few decades Vietnam has been re-developing in a very fast pace. Most scholars attribute the origins of this idea to futurologist Herman Kahn's World Economic Development: 1979 and Beyond. In modern times, waves of critique along with vilification against Confucianism arose. The Taiping Rebellion, New Culture Movement and Cultural Revolution are some upsurges of those waves in China. Taiping rebels described many sages in Confucianism as well as gods in Taoism and Buddhism as mere legends. Marxists during the Cultural Revolution described Confucius as the general representative of the class of slave owners. Numerous opinions and interpretations of Confucianism (of which many are actually opposed by Confucianism) were invented. In South Korea, there has long been criticism of Confucianism. Some South Koreans believe Confucianism has not contributed to the modernization of South Korea. For example, South Korean writer Kim Kyong-il wrote an essay entitled "Confucius Must Die For the Nation to Live" (공자가 죽어야 나라가 산다, gongjaga jug-eoya naraga sanda). Kim said that filial piety is one-sided and blind, and if it continues social problems will continue as government keeps forcing Confucian filial obligations onto families. ↑ This phrase of a certain negative context became popular after its usage in many Anti-Confucianism movements in China, most notably the New Culture Movement and the Cultural Revolution. ↑ Yao (2000), pp. 38-47. ↑ Rickett, Guanzi - "all early Chinese political thinkers were basically committed to a reesteablishment of the golden age of the past as early Zhou propoganda described it." ↑ Lin, Justin Yifu (27 October 2011). Demystifying the Chinese Economy. Cambridge University Press. p. 107. ISBN 9780521191807. ↑ Fingarette (1972), p. 1-2. 1 2 Adler (2014), p. 12. ↑ Adler (2014), p. 10 quote: [...] Confucianism is basically non-theistic. While Heaven (tiān) has some characteristics that overlap the category of deity, it is primarily an impersonal absolute, like dao and Brahman. "Deity" (theos, deus), on the other hand connotes something personal (he or she, not it). ↑ Adler (2014), p. 12 quote: Confucianism deconstructs the sacred-profane dichotomy; it asserts that sacredness is to be found in, not behind or beyond, the ordinary activities of human life — and especially in human relationships. Human relationships are sacred in Confucianism because they are the expression of our moral nature (xìng 性), which has a transcendent anchorage in Heaven (tiān 天). Herbert Fingarette captured this essential feature of Confucianism in the title of his 1972 book, Confucius: The Secular as Sacred. To assume a dualistic relationship between sacred and profane and to use this as a criterion of religion is to beg the question of whether Confucian can count as a religious tradition. 1 2 3 Tay (2010), p. 102. ↑ Billioud (2015), p. passim. ↑ Yao (2000), p. 52-54. 1 2 Adler (2014), p. 10. 1 2 3 Tay (2010), p. 100. 1 2 Littlejohn (2010), p. 35. ↑ Littlejohn (2010), p. 35-36. 1 2 Littlejohn (2010), p. 36. 1 2 Littlejohn (2010), p. 37. ↑ Littlejohn (2010), p. 36-37. 1 2 Runes, Dagobert D. (1983). Dictionary of Philosophy. Philosophical Library. p. 338. ISBN 978-0-8022-2388-3. ↑ "論語 : 雍也 - 中國哲學書電子化計劃". 中國哲學書電子化計劃. ↑ "論語 : 顏淵 - 中國哲學書電子化計劃". 中國哲學書電子化計劃. ↑ "The Analects : Ba Yi - Chinese Text Project". Chinese Text Project. ↑ "Mengzi : Li Lou II - Chinese Text Project". Chinese Text Project. ↑ "孟子 : 梁惠王下 - 中國哲學書電子化計劃". 中國哲學書電子化計劃. ↑ "論語 : 憲問 - 中國哲學書電子化計劃". 中國哲學書電子化計劃. ↑ Taylor, Rodney L.; Choy, Howard (2003). The Illustrated Encyclopedia of Confucianism. 1 (1 ed.). New York: The Rosen Group, Incorporated. pp. 48–50. ↑ "Confucianism: Definition, Beliefs & History". Study.com. ↑ Cristian Violatti. "Confucianism". Ancient History Encyclopedia. ↑ Super User. "The Origin of Confucianism - CHOSON ARCHIVES". chosonkorea.org. 1 2 3 Chen (2012), p. 175. 1 2 Chen (2012), p. 174. ↑ Billioud (2015), p. 148. ↑ Billioud (2015), p. 152-156. 1 2 Mungello, David E. (1971). "Leibniz's Interpretation of Neo-Confucianism". Philosophy East and West. 21 (1): 3–22. doi:10.2307/1397760. 1 2 3 Lan, Feng (2005). Ezra Pound and Confucianism: remaking humanism in the face of modernity. University of Toronto Press. p. 190. ISBN 978-0-8020-8941-0. ↑ Frankel, James (2009). "Uncontrived Concord: The Eclectic Sources and Syncretic Theories of Liu Zhi, a Chinese Muslim Scholar". Journal of Islamic Studies. 20: 46–54. doi:10.1093/jis/etn062. Retrieved 12 September 2011. ↑ Stéphane A. Dudoignon; Hisao Komatsu; Yasushi Kosugi, eds. (2006). Intellectuals in the modern Islamic world: transmission, transformation, communication. London: Routledge. p. 250; 375. ISBN 0-415-36835-9. Retrieved 28 June 2010. ↑ Sun Tai Chi Institute of Boston. "Sun Tai Chi Institute of Boston - Sun Style Taijiquan & Qigong". suntaichiboston.com. ↑ "Cook Ding's Kitchen: Confucianism and Martial Arts". cookdingskitchen.blogspot.co.il. 1 2 3 4 5 Adler, Joseph A. (Winter 2006). "Daughter/Wife/Mother or Sage/Immortal/Bodhisattva? Women in the Teaching of Chinese Religions". ASIANetwork Exchange, vol. XIV, no. 2. Retrieved 18 May 2011. ↑ "春秋繁露 : 基義 - 中國哲學書電子化計劃". 中國哲學書電子化計劃. 1 2 "Asia-Pacific | Confucian family tree 'triples'". BBC News. 2009-09-25. Retrieved 2012-11-08. 1 2 Elman 2005, p. 112. 1 2 Gunn 2003, p. 108. 1 2 3 Yang 1961, p. 26. ↑ "Introduction to Confucianism". urantiabook.org. Adler, Joseph A. (2014), Confucianism as a Religious Tradition: Linguistic and Methodological Problems (PDF), Gambier, Ohio, USA: Kenyon College . William Theodore De Bary (1989). Neo-Confucian Education: The Formative Stage. University of California Press. pp. 455–. ISBN 9780520063938. Billioud, Sebastien; Joel Thoraval (2015). The Sage and the People: The Confucian Revival in China. Oxford University Press. ISBN 0190258144. Chen, Yong (2012). Confucianism as Religion: Controversies and Consequences. Brill. ISBN 9004243739. John W. Dardess (1983). Confucianism and Autocracy: Professional Elites in the Founding of the Ming Dynasty. University of California Press. ISBN 9780520047334. Fingarette, Herbert (1972). Confucius: The Secular as Sacred. New York: Harper. Li-Hsiang, Lisa Rosenlee (1 February 2012). Confucianism and Women: A Philosophical Interpretation. SUNY Press. pp. 164–. ISBN 9780791481790. Payette, Alex. Shenzhen's Kongshengtang: Religious Confucianism and Local Moral Governance. Part of: Role of Religion in Political Life, Panel RC43, 23rd World Congress of Political Science, 19–24 July 2014. Tay, Wei Leong (2010). "Kang Youwei: The Martin Luther of Confucianism and His Vision of Confucian Modernity and Nation" (PDF). Secularization, Religion and the State. University of Tokyo Center of Philosophy. Yang, C.K. (1961). Religion in Chinese Society; a Study of Contemporary Social Functions of Religion and Some of Their Historical Factors. Berkeley: University of California Press. Yao, Xinzhong (2000). An Introduction to Confucianism. New York: Cambridge University Press. ISBN 0521643120. "Confucius". Internet Encyclopedia of Philosophy. "Neo-Confucian Philosophy". Internet Encyclopedia of Philosophy.